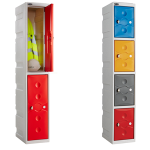 Plastic Lockers Archives - Shelving & Racking Ltd.
Ultrabox plastic lockers are a stylish and versatile range, suitable for indoor or outdoor use. They are corrosion proof, highly water resistant and require no on-site assembly due to the unique one piece shell design. The door and body are made from super strong polyethylene. 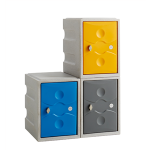 Storm lockers include a neoprene internal door seal to make them fully waterproof. Supplied with water resistant cam lock or hasp lock, other locks including combination and coin operated are available on request. All our lockers have an ACTIVECOAT anti-bacterial powder coating which provides a 99.9% Reduction of MRSA, E-Coli & Bacteria for the life of the coating.